Horst Koehler, envoy of the U.N. secretary-general for Western Sahara, talks to reporters after a two-day round of talks on ending the Western Sahara conflict, at U.N. offices in Geneva, March 22, 2019. A second round of U.N.-mediated talks aimed at solving the Western Sahara conflict has ended with no resolution, but with an agreement by the Moroccan and the Polisario Front delegations to meet again. "Nobody should expect a quick outcome, because many positions are still fundamentally diverging," he said. "At the same time, being able to listen to each other, even when things get controversial, is an important step to build trust." 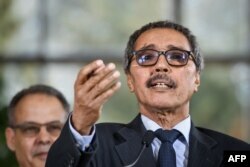 Khatri Addouh, leader of the Sahrawi delegation and the Polisario Front, gestures as he talks to reporters after a two-day round of talks on ending the Western Sahara conflict, at U.N. offices in Geneva, March 22, 2019. "The costs of this conflict, in terms of human suffering, lack of prospects for the youth and security risks, are far too high to be accepted," he said. "Therefore, we must not relent in our search for a compromise."